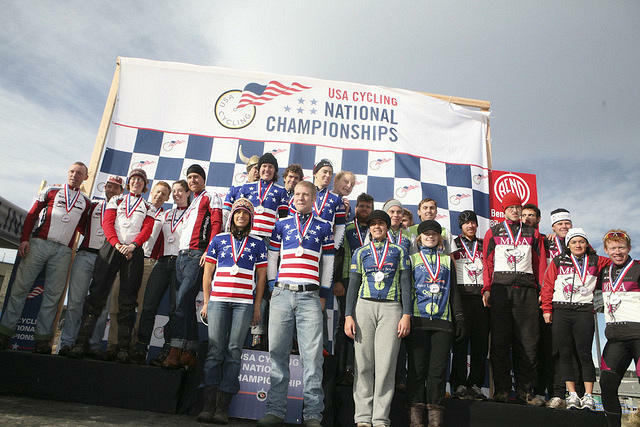 MHC Cycling raced to a 2nd place in the Collegiate National Cyclocross Championships on Sunday. Held on a technical and muddy course in Bend, Oregon’s Old Mill District, the team overcame both crashes and mechanicals to earn its first national championship team podium. Competing for the men were Matt Willing, Kyle Knott, Tim Jenkinson, and Paul Webb. Three women represented MHC: Klara Rossouw, Stephanie Bunnett, and Yolanda Colon. It was a true team effort with every rider’s placing counting toward the team overall. The strong performance moves MHC into the #1 national ranking among Division II schools. The ranking is a year-long competition that combines results from collegiate cycling’s four national championships: mountain biking, track, cyclocross, and road. With three of the four complete and only road nationals remaining, the team will take a short break for the holidays before resetting focus on its next goals: a podium at road nationals and defense of the #1 ranking. Road nationals will be held on May 6-8 in Madison, Wisconsin. Start of the men's race on Sunday. Conditions would deteriorate. 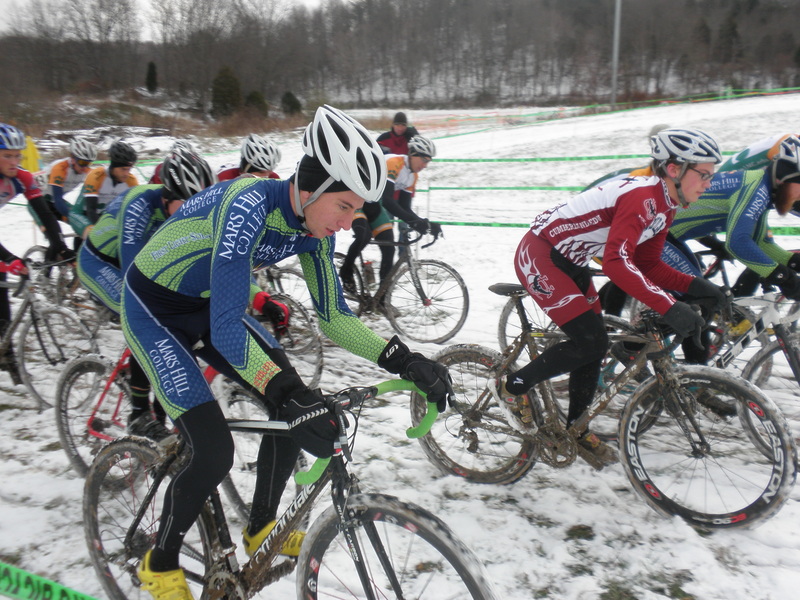 The Southeastern Conference’s inaugural cyclocross season came to a wintry close last weekend in Unicoi, Tennessee. After seven regular season races that saw atypical and rather warm cyclocross weather, we finally got some snow and mud to battle in, which was great preparation for this Sunday’s national championships in Bend, Oregon. On Saturday, the grass course was rideable except for the barriers and lap times were fast. In the women’s event, Carla Swart from Lees-McRae took the win. Mars Hill’s Klara Rossouw, Stephanie Bunnett, and Yolanda Colon finished in 5th, 6th, and 7th, the first three D2 women. Twenty-two took the start in the men’s event as a heavy snowfall began, and the course began to show some wear, an ominous foretelling of the next day’s conditions. Still, the conditions required few dismounts. Eric Thompson won handily; Mars Hill’s Matt Willing, Paul Webb, Tim Jenkinson, and Kyle Knott finished in 5th, 8th, 10th, and 12th. With snowy conditions continuing overnight, just getting to Sunday’s event became a challenge. At the start of the women’s event, inches of snow covered the course. With temperatures in the mid 20’s, snow and mud quickly accumulated on bikes, making for some slow going. 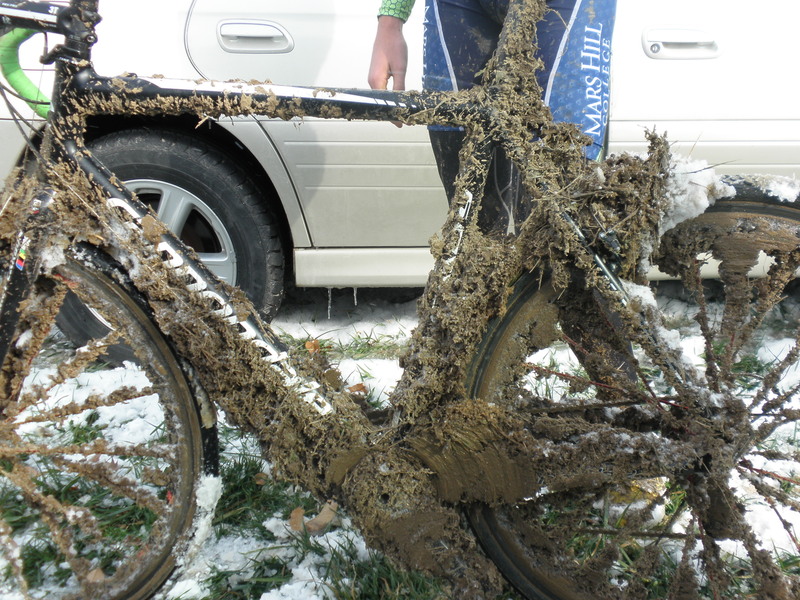 Two riders from Lees-McRae were unable to continue pedaling: their wheels, clogged with snow and mud, froze in place. Erica Zaveta from Lees-McRae won the race with Mars Hill’s Rossouw taking a strong 2nd and Bunnett finishing in 3rd. Matt Willing's bike after Sunday's race. By the start of the men’s event, the course was pretty ripped up and got worse as the race wore on, requiring several dismounts per lap. The snow and icy mud clogged drivetrains and wheels, adding up to 10 pounds of weight and turning most bikes into single speeds. Eric Thompson once again prevailed in the men’s event with a convincing ride. Mars Hill’s Matt Willing stayed with Thompson for the first couple of laps before finishing a strong 3rd. Webb and Jenkinson rode well in the conditions too, finishing 4th and 5th. Knott was 14th. After all of the points were tabulated, Mars Hill won the Div II team championship; Klara Rossouw won the women’s overall title; and Matt Willing won the overall men’s title. The team looks to carry this momentum forward to this Sunday’s Collegiate National Cyclocross Championships in Bend, Oregon, where the conditions promise to be similar. Full results and points can be found on the conference’s website HERE. As always, big thanks to our many supporters and sponsors.